Managing Extreme Financial Risk addresses the need for better management strategies in light of increased market risk and volatility in financial institutions' revenue models. Top officials from the financial and regulatory industries point to real corporate issues, showing how institutions react to financial crises. From first-hand experiences, they explain how effective sustainability management does not just prevent being blindsided; it also leads to proactive solutions that enhance an institution's strength to weather a sudden financial crisis, add significant shareholder value, and reduce systemic risk. 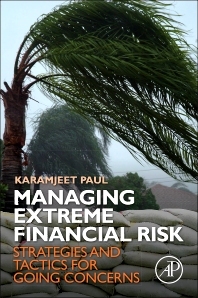 Readable, coherent, and logical, Managing Extreme Financial Risk shows how extreme risk needs to be handled when the cost of being wrong means the difference between life and death of the institution. Executives, board members, and regulators as well as undergraduate and graduate students working in all subdisciplines of finance, especially risk management and financial institution management. 1.4 Do Regulatory Requirements Address Effective Management of Tail Risk? 1.9 Is the Need For Tail-Risk Management New? Chapter 2. Tail Risk is the Culprit: Tail Wagging the Dog? 2.4 Could the Problems of 2008 Have Been Avoided? 3.1 Why a Distinct Approach? 3.5 Is the Sole Focus on Risk Management Prudent? 15.5 Too Complex to Manage? Karamjeet Paul has over 30 years of operating, finance, treasury, and exposure managment experience, giving him unique expertise in identifying and addressing critical risk-exposure-reward and other strategic issues at the highest levels in large organizations. Mr. Paul's perspective has been gleaned from hands-on experience in large global organizations, startups in entrepreneurial settings, and consulting assignments.